Thomas Jefferson said, “Nothing can stop the man with the right mental attitude from achieving his goal.” In preparing for a marathon, we see how this credo applies to business as well. THOUGH IT MAY NOT SEEM like it when we’re drenched in sweat and our legs feel like lead, running a marathon is as much mental as physical. When we’re exhausted, continuing consists of mind over matter. This takes enormous mental power. Once developed, this skill can be transferred from the racetrack to the boardroom. Training for a marathon is an ideal place to improve some of the requisite skills needed to achieve success in business: strategy, clear objectives, and a positive attitude. These techniques are also crucial to completing a marathon. Without them, even the most fanatically fit athlete is doomed to fail. Through physical training we can develop and master these skills. In business, investment, and competitive sports, a well-planned strategy is essential. In each situation, we must commit to our plan, yet be willing to adapt it if it isn’t working. Though strategy can be complex or simple, with our first marathon it’s best to choose the latter. Simplification is a great way to remove self-imposed pressure. This can mean concentrating on maintaining a steady pace or heart rate. You must do this during training and in the marathon, since sustaining this relaxed-focus helps remove the barrier of performance anxiety. The strategy of shifting attention to our body’s sensations is called “association”, and it’s a tactic used by many elite athletes. The self-focused introvert may find this more comfortable than directing attention outside. The extrovert, however, may be more suited to the “disassociation” technique. This involves turning our awareness outward. According to a report published in the Journal of Sports Psychology: “Considerable evidence exists to link disassociation strategies with increased pain tolerance during endurance tasks.” Disassociation may also be useful during a dull seminar, or an extended visit from our mother-in-law. Just as business meetings have objectives, so should your marathon training. Whatever your personal goal, it needs to be specific, measurable, and reasonable. Similar to our professional life, these can be accomplished by choosing to focus on either the process or the outcome. In business, a process goal would be improving customer relation skills, while an outcome goal would be making X amount more copecks. For your first marathon, process goals are better, since they may be as simple as adhering to a training schedule. As we all know, success produces self-confidence. Developing this gives us courage to challenge ourselves to achieve greater victories. Outcome goals, like beating a rival, are more risky. Since external factors can interfere with them, they are harder to bring to success. Maintaining a positive attitude is crucial to accomplishment. Without belief in eventual success, you may quit at the slightest obstacle. This is true of races that occur in the workplace as well as on the track. Everyday, marathon training teaches us persistence through discomfort. This is essential. Without challenging ourselves we can never progress to higher success. Besides the things we tell ourselves, a positive attitude also includes motivating inner images. This strength doesn’t end in our legs and lungs. 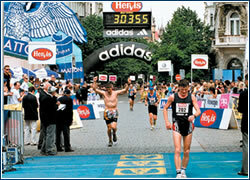 Finishing a marathon makes us more tenacious, helping us “bring home the gold” in business.